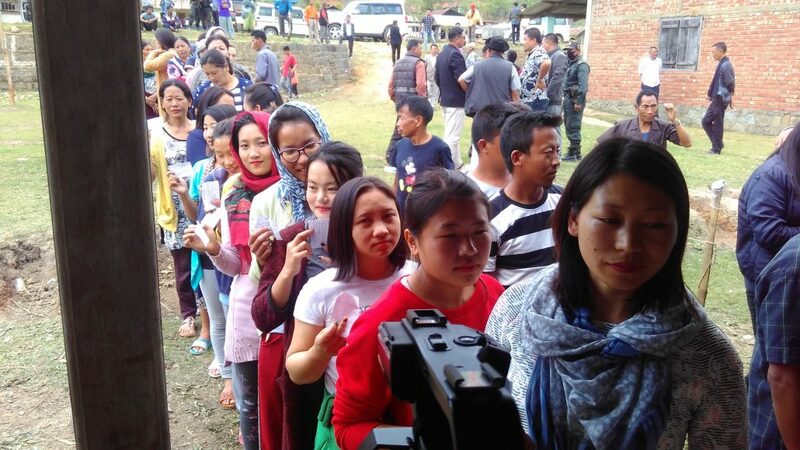 The voting for the Outer Manipur parliamentary constituency passed off largely peaceful in the first of the two-phase elections in Manipur along with 90 other seats across the country. The turnout of the voters at 1,562 polling stations, including all polling stations of Churachandpur Assembly constituency and the model polling stations in other districts managed by only women polling officials and security personnel, across 28 Assembly constituencies located under 12 districts of the state, was low in the morning. However, it picked up as the day progressed. Thus the poll percentage recorded till 9 am (15.6 per cent) was slightly increased to 35.03 per cent at 11 am. Subsequently, the poll percentage started increasing slowly when this reporter visited some of the polling stations including model ones in Kangpokpi and Senapati districts around 3pm(68.16 percent). Finally at 5 pm, according to chief electoral officer PK Singh, the voter turnout reached 78.20 pe rcent. In many places, there were long lines of voters at close of poll hour of 4 pm, said the CEO adding that the final figure will be known only after all polling parties reach back. One of the significant features of the first phase polling for outer Manipur parliamentary constituency is the voting arrangement at a designated camp of the Kuki National Front, an armed group presently engaging under suspension of operations with the state and central governments. Local reports said the polling was held with ballot papers and the polling booth stationed at the designated camp was manned by district officials. A total of 10,10,618 electorates, including 5,15,022 women were eligible to exercise their franchise in the first phase to decide the electoral fate of 8 candidates. The candidates who are in the fray are BJP candidate Benjamin Mate, Naga People’s Front (NPF) candidate Dr Lorho S Pfoze and Congress candidate K James, Thangminlien Kipgen of the National People’s Party, Ashang Kashar of the North East India Development Party, Hangkhanpau of Janata Dal (U), Angam K Kom of the Nationalist Congress Party and Independent candidate Laikham Kaipu. In 2014 Lok sabha polls Thangso Baite of congress won the seat by defeating his nearest rival Soso Lorho of NPF.